Since I am taking a little rest from blogging, this article came to my mind first. I pray that it will encourage some weary soldiers of Christ to take a rest, but just don’t quit! Quitting isn’t always for losers, it is usually the sign of a weary or worldly soldier of Christ. 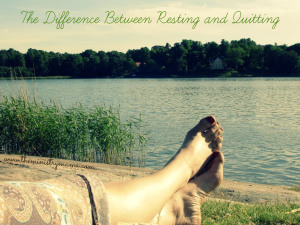 There is a definite difference between quitting and resting. One of the first things that comes to my mind when I think of this topic is a note that someone wrote to a pastor friend in the yearbook when he graduated with his Master’s degree. The last line of the note said, “Remember, sometimes you must rest a while, but just don’t quit.” Even years later I remember that one line. God has used it to help me, and I pray He will also use it to help you.